Daimler is heralding the arrival of the next Mercedes-Benz S-Class in the form of a sculpture and a series of projections to be displayed at the Paris motor show. With its sculpture entitled "Aesthetics S", Mercedes-Benz is providing an artistic glimpse of the design of the luxury saloon of the foreseeable future. The aesthetics of the relief-like sculpture are combined with an exciting projection display. In the eyes of the observer, this creates a three-dimensional world and enables the creative imagination of the designers to be visualised to impressive effect. The modern production in three acts, developed by the Mercedes-Benz designers, will be on display in Hall 1 at the Paris Motor Show (27 September to 14 October 2012). I've spared you the many other paragrpahs which follow the opener above, but the press release goes on to explain that the art installation (what it sounds like to me) is all about the next S-Class. There are also nine preview images, which seem to be either stills from the projection show, or details of the car's lines. I'm not convinced that they hint at a sedan, though. 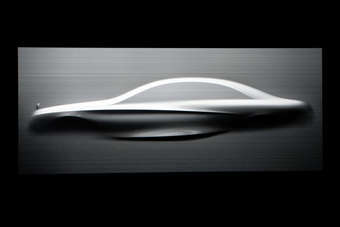 Perhaps the rumoured S-Class Coupe, the supposed replacement for the CL-Class, will be revealed ahead of the sedan. When will we see the new S-Class? It's interesting that Daimler is acknowledging the model to a Western European audience, almost as a courtesy, yet we all know that large luxury sedans sell far better in other parts of the world nowadays. My money would be on the covers being pulled off the real thing on 22 November at the press preview day of the Guangzhou motor show.